With few exceptions, New York has always been a round-pie, thin-crust town. (They don’t call it a “regular” slice for nothing.) 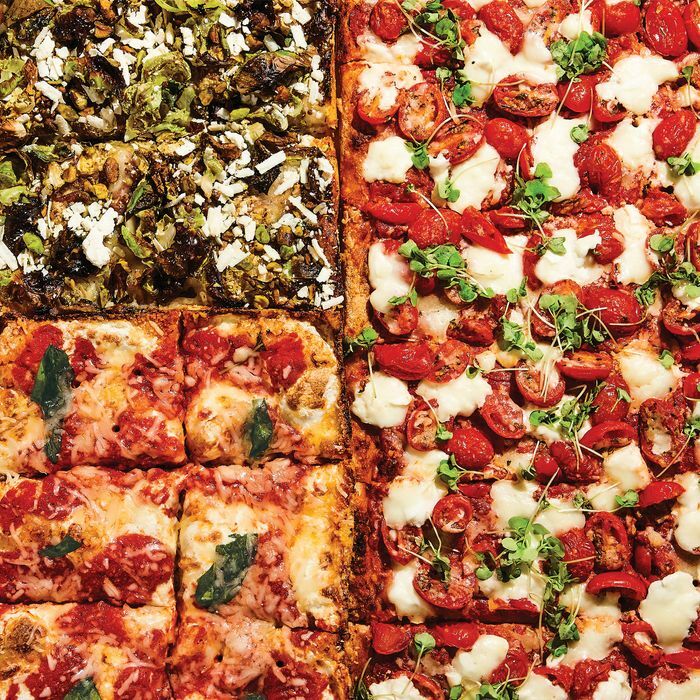 Recently, though, the square has stepped into the spotlight, thanks largely to an obscure midwestern interloper called Detroit-style pizza, which arrived in Williamsburg last spring and proceeded to give our hometown Sicilian something of an inferiority complex. Luckily, a local movement was happening at the same time, with talented bakers reinvigorating old forms like the grandma pie and the upside-down Sicilian, and rogue Italian pizzaioli rebelling against the Neapolitan orthodoxy with newfangled Roman pizza al taglio and souped-up focaccia. The hottest pies of the moment don’t sag or flop or fold. And who can resist pizza dough that’s essentially fried to a crisp along the edges and on the bottom in a well-oiled pan? That’s the beauty of the square. It’s made of sturdier stuff for worrisome times — firmer crusts, deeper doughs, longer bakes, and heartier toppings. Here, a taxonomy of styles and where to find them. Thin-to-medium-thin pan pizza that references the pies nonnas baked at home for their families. It’s said that the name, if not the style, made its debut at King Umberto’s on Long Island in the ’80s. Brooklyn-born pie man Nino Coniglio, whose passion for pizza takes both retro and newfangled forms, has spread the grandma gospel around town at both locations of Williamsburg Pizza (265 Union Ave., Williamsburg, and 277 Broome St.) and at Brooklyn Pizza Crew (758 Nostrand Ave., Crown Heights). It’s twice baked, and the sauce goes on top of the cheese, but Detroit-style pizza is all about the racy, lacy, Friulian-frico-like fence of fromage that forms around the edges. Cooked in special steel pans with tall, angled sides (originally, trays for holding automotive parts), it’s not unlike some ethereal cross between Sicilian and Chicago deep dish. Buddy’s Rendezvous in Detroit invented it in 1946, and Emmy Squared (364 Grand St., Williamsburg) made it a thing in Brooklyn 70 years later. Emmy chef Matt Hyland shared tips and resources with Dale Talde, who serves several creatively topped versions at Massoni (11 E. 31st St.), and Williamsburg Pizza’s Coniglio occasionally offers a semi-secret riff he calls “Not Detroit Style,” so as not to provoke purists—or maybe it’s to dismiss them. Roman-style bakery pizza, long planks of dough cooked in pans or directly on the oven floor and cut into crisp, thin squares (al taglio means “by the slice”). Antico Forno on Rome’s Campo dei Fiori is famous for it, and in New York, so is Sullivan St Bakery (533 W. 47th St.). At Grand Central’s Prova Pizzabar (89 E. 42nd St.), Donatella Arpaia makes an impressive (and much more robust) hybrid version from great ingredients more often associated with Naples-style pizza. This focaccialike Sicilian-bakery pizza garnished with onions, anchovy, and bread crumbs is the precursor to the New York Sicilian style. If you time it right, you can get it at Prince Street Pizza in Nolita (27 Prince St.), where it goes under the alias Broadway Breadcrumb, and also at Brooklyn Pizza Crew. It’s a bit of an oxymoron in that the defining characteristic of the New York Sicilian style is its puffy height. Essentially, TCS is what is now more commonly referred to as grandma style. But Rizzo’s in Astoria (30-13 Steinway St.) has been calling its exceptionally crunchy squares thin-crust Sicilian since 1959. Flatbread ancestor to pizza of many permutations. The variously topped version at Eataly (200 Fifth Ave. and 101 Liberty St.) is soft and springy with a superrich flavor derived from great olive oil and long fermentation. Strictly speaking, it may not be pizza, but it looks like pizza, it tastes like pizza, and it’s among the most delicious squares of dough you’ll find in New York or anywhere.